Sage Financials: What’s New in Sage Financials July 2018 Upgrade? We’re back with July’s monthly Sage Financials (previously Sage Live) upgrade. Normally service is resumed this month and the upgrade is back to being a mandatory upgrade which means your Sage System Admin will receive a notification once the upgrade has been applied to your Org. You can expect this to be around the first week of the month. While this upgrade has seen less new features we have a plethora of fixes and improvements. 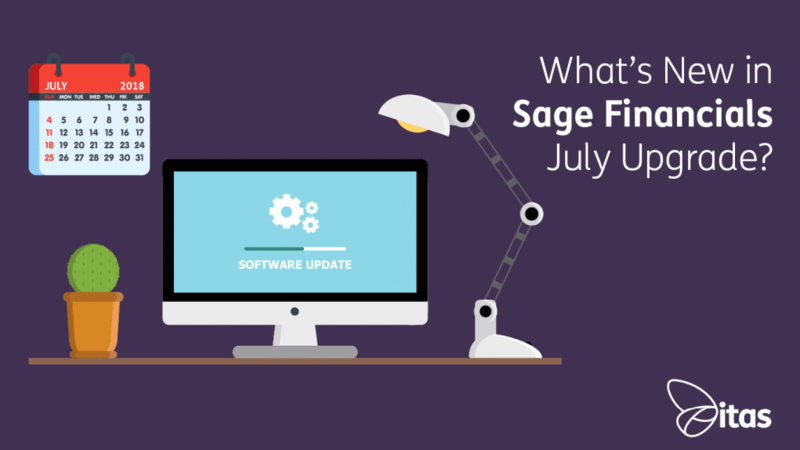 Here are our highlights from the Sage Financials July Upgrade. Within Sage Financials you will be able to see the status of your current background tasks and when one has finished within this new service. This allows you to be able to start a batch process without having to wait for it to finish. Sage Financials can now identify if your data is affected by any of the updates included in the monthly upgrades. Within the Manage Upgrades tab (within the System tab), you can view data error entries detected by the system. At the end of the Upgrade Wizard you will be notified if any errors have been detected. Each entry represents an issue which shows you what data needs to be fixed and explains what each fix will do. You can click ‘Apply Fix’ for each issue that appears in the entries. You may find that some fixes will require you to rebuild your ledger balances, an additional entry is added to the list when this happens. It may take some time to complete so if therefore recommended by Sage to run this after all other fixes. The Bank Account Name on an account is auto-populated. If the Bank Account Name is left blank, it will be auto-populated with the name of the supplier (UK Only). You can view all payments associated with a transaction in the new Payment History section. It has been added to the header on transactions. PDFs are not re-generated every time they are viewed when they don’t include the outstanding amount. The original PDF is shown when the PDF is viewed for a posted transactions. Manual ledger entries are now always posted with a period and financial year that matches the date, previously you were able to change the financial year and period to be different to the ledger entry date. Journals with more than 196 line items and have ‘Is Appendable’ selected can now be posted. The debit and credit lines are now cloned correctly when cloning a journal, allowing it to balance. When a transaction is converted, the correct custom PDF is selected. It is now possible to re-post Bank Takings journals with a large number of items. Bank journals created from bank feeds can now be appended to posted Bank Takings journals. Using a CSV import, you can now import the Discount Value on a transaction. When importing sales invoices, you can now include recognition schedules. The fields no longer reorder when changing the tag on a transaction header. Partial conversion of a credit note with a large number of products no longer generates an error. When creating customer and accounts from within a transaction, the Account Type field is now included ensuring that the new account can be selected on transaction types that have Business Filters applied. A friendly message is shown when the Customer Outstanding report has no results, rather than showing a blank page. When a user does not have access to a field, a friendly message is displayed. Retrospective Aged Debt and Aged Credit reports now include and report on credit notes correctly. You are now able to create accounts when the VAT registration number is a required filed. A single Bank Takings journal is now created per bank when importing bank transactions via bank feeds. If you have any questions about the latest Sage Financials Upgrade get in touch with a member of our team. Home » Sage Blog » All Sage Blog Posts » Sage Financials: What’s New in Sage Financials July 2018 Upgrade?